Roth 250 ° F (121 ° C) Underground Stations are designed to handle condensate that is above the boiling point. Low 1 foot (0.3 m) NPSH pumps provide full capacity at any liquid temperature up to 250 ° F (121°C). Discharge pressures of up to 75 psig (5.10 bar) can be achieved with these underground units. 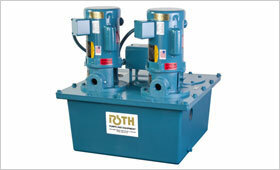 Dual pumps are supplied to control flow rates, needed for high volume returns. ASME receivers have capacities up to 320 gallons (1211 liters). This Roth unit is ideal for use with adsorption air conditioning equipment which normally condenses steam at temperatures above 230 ° F (110 ° C). 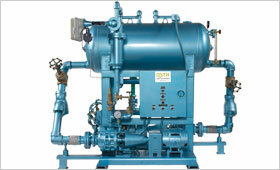 These units are also found in high temperature applications in the food, paper, plastic and rubber industries. Offering the widest variety of condensate return systems.